Last weekend we attended Arizona State Convention. The state convention is a wonderful time to meet new breeders, see friends, and compete against a wider pool of exhibitors. Many breeders who aren’t able to attend shows regularly will attend the state show, which is a wonderful treat. We took a full carload of rabbits in six breeds: Cinnamon, Champagne d’Argent, Blanc de Hotot, Silver Fox, New Zealand and mini satin. Many bunnies. Much fur. My body is still telling me we were busy shifting those carriers around! A carton of approximately 30 lbs. is not so bad when you first move it… but when you move it over and over… yikes! Oh my achin’ bones! It’s really exciting to report that we came home with a Best of Breed or Best Opposite of Breed in all the ones that we took except mini satin. (We only took one mini satin and he just couldn’t compete against the animals there. Arizona has some phenomenal animals! But we listened, took notes, and know where to work for the future!) What an encouragement that we’re doing something right! I think that encouragement is pretty huge. It’s very, very easy to get consumed with the hard things of raising rabbits – the litters that don’t work out, the poop that needs to be scooped, the grumpy intermediates who scratch you and make your hands look like they’ve been through a blender… there are plenty of things about rabbit raising that aren’t at the top of the “fun” list! For us, while receiving the recognition of having a top animal is great, I’ve learned that listening carefully to the judges will help encourage me about the strongest attributes of even our worst rabbits! Encouragement is awesome! The thing is, very few rabbits have nothing to commend them. If may be that this rabbit has a great head or strong shoulder or wider hindquarters. Maybe they don’t compete with the top animal, but there is always some thing encouraging to work with in the future if you’re able to see them all lined up together on a judging table. Even if it’s just validation that the rabbit I think it pretty awful is actually awful, going to a show is a great encouragement! I also really can’t talk up the folks who put on the Arizona State Convention enough. They know what they’re doing and they’re kind. There’s always a bit of drama (people being people) but the show committee isn’t the start of it or spreading it. Whether it’s addressing difficult decisions or making sure the judges are able to maintain a constant flow of rabbits on their table, these people are amazing. If you’re looking for a great show to add to your routine, consider Arizona! 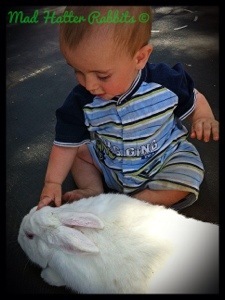 Forget Free Willy, Free Bunnies! For all we talk a good game of eating our uglies and realizing that everything has a purpose and sometimes that purpose is to be edible… Well, sometimes we just can’t pull the trigger. Case in point: this is Eclipse. She is a fantastic Silver Fox doe who has given us a ridiculous amount of joy during her life. It has become evident that she is past her child bearing prime but we struggled with wanting to use every cage, every hole to it’s greatest impact. So… Eclipse was turned loose in the back yard. She has been set free to hide underneath the saw horses supporting the Timothy hay bales and eat our lettuce sprouts. She loves it! It’s been a few months since we got a freely roaming lagomorph and we weren’t sure it would suit us. But it has! Since then we’ve retired two more of our older does who have earned a special spot. There are a few more holes being dug in our back yard but it’s been working wonderfully. The rabbits are living peaceably with our Great Dane and miniature poodle and it’s being done! They have not destroyed our feeble attempt at a garden and, as long as we keep them away from the bucks, I believe we have a winning combination. 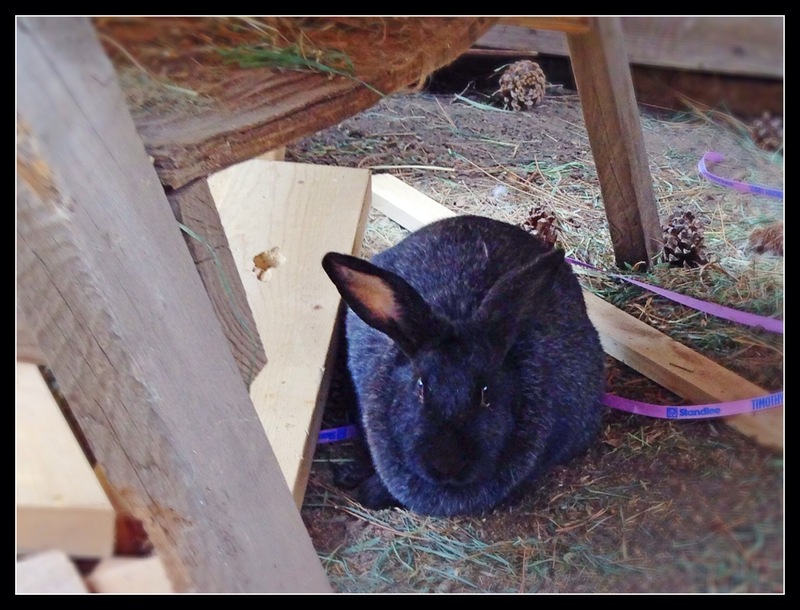 A 10-lbs rabbit (or two… Or three) does tend to startle the uninformed, however. We had a friend over and when he saw the rabbit resting a few feet away from him he visibly startled. We all got a chuckle out of his reaction and the rabbits ended up coming over for scratches! Newest Rare Breeds List Released! We are pleased to be raising the #1 rare breed in the U.S.! Glad to be doing our part to keep Blanc de Hotot going! Every three years a “rare breed” list is released. We’ve been raising three of the 15 rare breeds until now… And with the release of this list we now have two! Cinnamon and Silver Fox are making a come back! 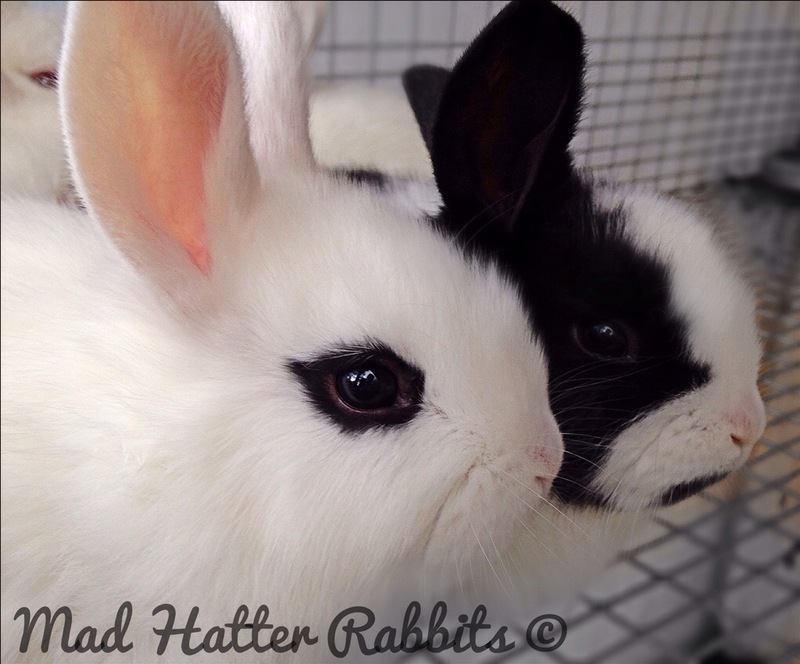 What is the Rare Breeds List? We’ve decided to put our trampoline to another purpose lately – the large space and netted enclosure has been perfect for doubling as a rabbit run. The rabbits are on a rotation and it’s fair to say they love their time in the trampoline, bounding, hopping and generally frolicking about. 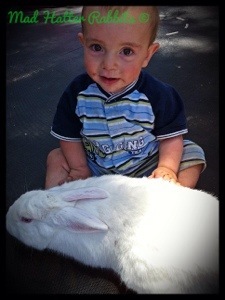 Because I was tired of holding the baby I did some analysis and decided to pop our 10 month old son, who’s a very able crawler, into the tent with the rabbit. Within minutes he’d located Fennel, our white Silver Fox, and was giving him loves. This is why I love our Silver Fox rabbits! They are laid back to the extreme. It’s a little bit like what I see in Saint Bernard or Great Dane dogs – they’re huge, they have nothing to prove, and they can just be cuddle bugs! We have black, blue, and white Silver Fox at our house. The only recognized color for showing right now is black – although blue is under development and will likely be showable in the next year. They are all sweet, but our white SF have really stolen my heart. Their fur is amazing and their personalities are gentle.